The Different Types of Cruises: Which One Suits You Best? 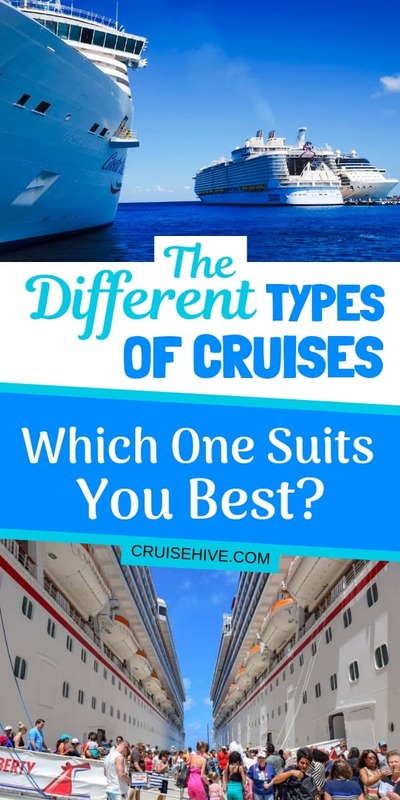 Cruise Tips The Different Types of Cruises: Which One Suits You Best? Time to find out about the different types of cruises and which one would suit you best. You'll be surprised at the wide range of cruise vacations around. Going on a cruise means getting on a fancy huge ship, spending days on the sea, and then stopping by an amazing port. That’s it right? Well, no. That’s not exactly all of it, there are several different types of cruises. If you think cruises are expensive, over-the-top, ‘close to impossible’, and is like living in a dream, then you most likely have one of those famous luxury cruises in mind. What can you expect with this dreamy kind of cruise? If you’re a big fan of space, then you’re sure to get a lot of it with this type. You can get everything from duplex staterooms, to suites with over 2000 square feet. Most also come with private balconies. More than the space though, what elevates a luxury cruise above others is the amenities you get to enjoy and the overall experience that getting premium service offers. Think beautifully-appointed spas, signature brand toiletries, cutting-edge technology, and special attention given to decor detail in every square foot. Add to that the in-room mini bars, gourmet meals, wines with each one, and concierge service. Luxury cruises are also most remarkable for their attendant to guest ratio. They normally accommodate a smaller number of guests, and they have more staff (think butlers, suite stewards, concierge attendants, daily housekeeping, etc.) to take care of the guests’ every need. Sometimes, what you’re aiming for is to get to your dream destination and take it from there. This is how the ‘fly and cruise’ option works. Basically, you fly in directly to the port of call, and then take the cruise from there to explore the rest of the area. Once the cruise is over, you are brought back to the airport so you can fly back home – or linger a little bit more. One of the best points of this type of cruise is that you’re able to make the most of your time in the destination and go on your own little tours of the place. This is great for those who have a number of must-see attractions on their list or must-do activities in a certain location. They also get to visit other interesting ports once it’s cruise time on the ship, enjoy the amenities, and spend it with other adventure-seekers onboard. Taking the entire pack with you for a cruise to remember? Family cruises give you a remarkable venue to make some awesome memories. Family cruises are packed to the brim with activities that cater to individuals of different ages. From your little tots to teenagers, to couples and even seniors, this type will give you plenty of great options to make your cruise days enjoyable. Older kids can enjoy surfing pools, basketball courts, bowling alleys, video games, and even skating rinks. Your family also have the option to do some on-sea adventures like banana boating, snorkeling, and sailing. Cruises for families also feature toddler-friendly areas, enrichment programs, and even camps that let them mingle with other kids their age doing fun and meaningful activities while onboard. Carnival Cruise Line and Royal Caribbean are perfect for the entire family to enjoy a fun-filled cruise vacation. Meanwhile, parents can also enroll to cooking classes, spend some time on the miniature golf course, relax in the ship’s spa, or try out the overflowing dining options. Accommodations are usually family-friendly – there are duplex suites and adjoining rooms too. The price tag attached to this kind of family adventure may be more than what you usually spend. But, with all the places it takes you and your family, all the amenities and activities it lets you do, and with meals and accommodations usually included in the packages, it would turn out to be a grand trip that’s worth every cent. Going on a cruise is definitely an ideal way of celebrating such a huge event in your life – your wedding day. Now if you want something extra special to make it even more memorable, don’t just go on any out-of-town or out-of-the-country trip – go on a honeymoon cruise! While it has all the adventures the usual cruise promises, a honeymoon cruise is set up in such a way that couples will find it to be the ultimate romantic date of their dreams. Think candlelit dinners under the stars with a string quartet serenading you and your partner, lounging in a jacuzzi on the ship’s deck, overlooking the mesmerizing stretch of ocean, luxurious cabins, and an exotic port of call that guarantees more romantic moments you can share together. On honeymoon cruises, you can also make special arrangements for items like matching robes, romantic dinners and cabin treats. Definitely a great way to punctuate your happily ever after! Want a cruise that’s unique and really speaks to your heart? Try out themed cruises – this is the type that’s especially set up to answer to a target market’s needs. For example, you would now find cruises that revolve around themes like African safaris, car races, French cuisine, and historical events/sites among many others. Even more extraordinary and colorful are themed cruises that have annual festivals as their theme. The best thing about these themed cruises? They let you share the experience with others who have the same interests, and you also still get to enjoy the luxuries that come with cruising – fine dining, breathtaking sights, and that relaxing environment that being on the ocean brings. Not yet ready for a full-on cruise? Go on a mini cruise instead. This type usually lasts for about 4 days (7 days at most), and can travel to nearby attractions or to international destinations. You still get the full experience of excitement and luxury onboard, with meals, accommodations, and activities usually included in the cruise package. However, excursions in the port of call are normally shorter and fewer compared to normal cruises. This is best for those who want to try out the cruise experience but are short on time (and budget!). So, which types of cruises would you be interested in booking? Take your pick and make the most of your time on the high seas!